I wear short sleeved Icebreaker T-shirts when I am hiking. My ideal top would be a lightweight long sleeved collared shirt but I am still searching for the right combination of fit, comfort and fabric. So, in the absence of all that, I go for short sleeved Icebreaker T-shirts. The only problem is that I need to cover my arms when the temperature rises or when I’m outdoors for long periods of time. The perfect solution is removable arm sleeves. But be warned….they are very hard to track down! After much searching I purchased Outdoor Research Activeice Sun Sleeves. These sleeves come in two sizes (S/M and L/XL) and are made from polyester/spandex to ensure they are form fitting. The down side is that they can be a little snug so if you are muscle-bound you should go up a size, if possible). The Outdoor Research Activeice Sun Sleeves comes in two colours – Alloy (grey), and Lemongrass (bright green), although you will struggle to buy the green in Australia. The UV protection is UPF 50+ so that is equivalent to some of your clothing. 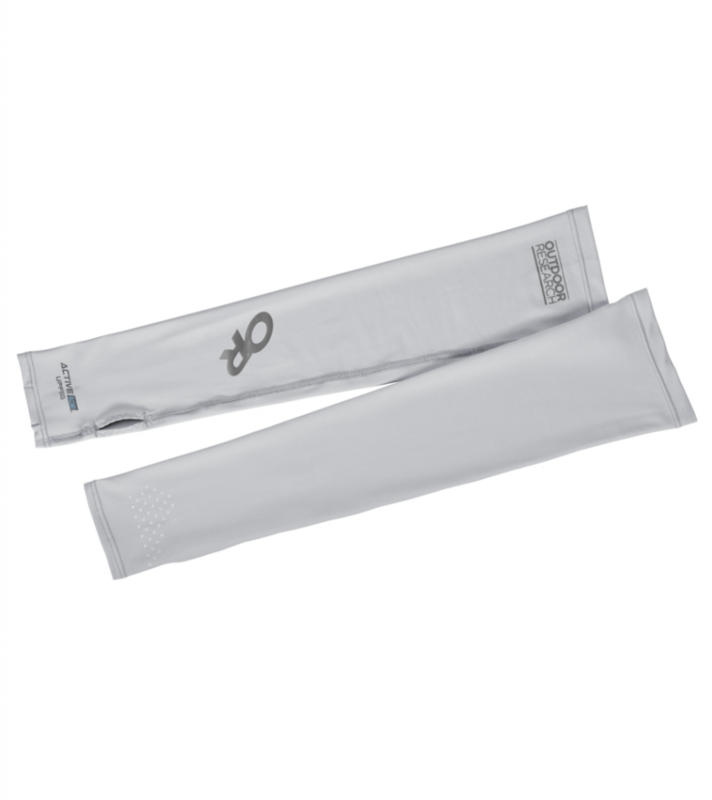 At around $50AUD for a pair, they are comparably priced to similar products in the compression gear range at sports stores or the sun blocking range at the Cancer Council although the cancer Council offering does provide UPF 100+ . The great thing about the Outdoor Research Activeice Sun Sleeves is that they have a thumb slit which lets you pull the sleeves over your hands – this is a big plus for me as I do like to protect my hands from the sun particularly when I am using my walking poles. How many of you have ended up with the backs of your hands sunburnt in hot conditions? The sleeves stand up to harsh conditions and wash well. They are however a little prone to ‘pilling’ but this is a minor cosmetic issue. I always have my Outdoor Research Activeice Sun Sleeves in my pack, putting them on and taking them off as the conditions dictate. They are definitely worthwhile for those of us who tend to wear short sleeves in Australia’s harsh conditions.